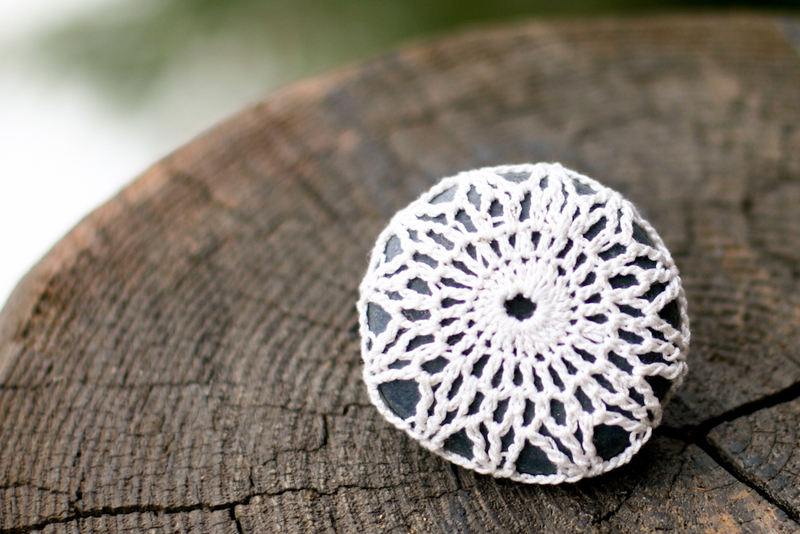 Ever since I entered the blogging world and saw crocheted stones, I have wanted to make one. I think they are gorgeous. The crochet skill required just seemed far beyond my crochet abilities however, which were pretty much limited to this potholder I blogged about long ago. Seeing something so beautiful that I want to make made me anxious to put an end to the inequity. 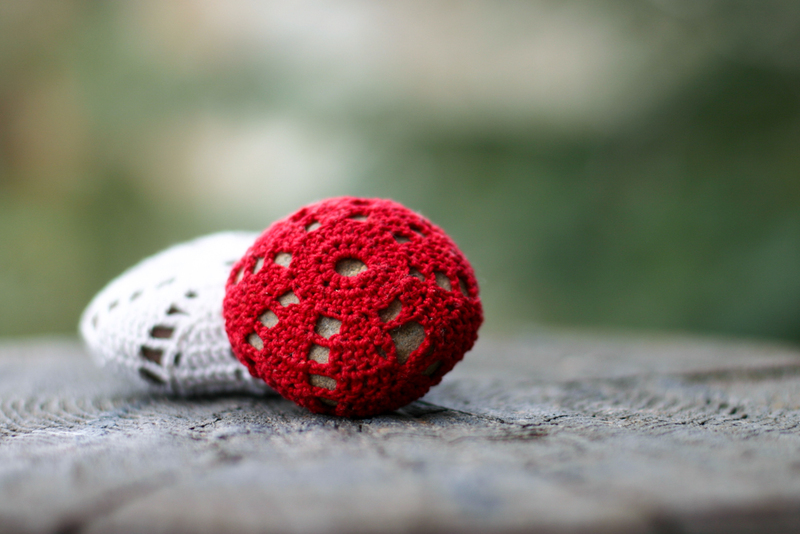 Then, I saw this tutorial by Margaret Oomen on Purl Bee. For the pattern on Purl Bee, she says you need only know how to chain, single crochet and double crochet–that’s it. I can do that, I thought. So I went out and got the crochet thread and the needle and they sat around for months. When my mother’s birthday popped up on the horizon, I thought–what a perfect opportunity to finally try to make these. This post will be a spoiler for her if she reads my blog as often as I think she does. Surprise Mom! I hope you like them. Sandy, my husband’s, response was typical–what is that for?? But, my husband tends to think that way–all about the practical, none about the aesthetic. I think they are beautiful. Margaret’s photos and tutorial were helpful and after a few fits and starts and trying to understand how the pattern worked, I got it! You can too! Of course, I have this weird thing, where I can’t stop. After doing her pattern twice (okay, maybe six times if you count the ones I ripped out in the middle and started over), I wanted to try a different pattern. I mean look at these beauties in this photograph from Purl Bee. I want to make me some of those! 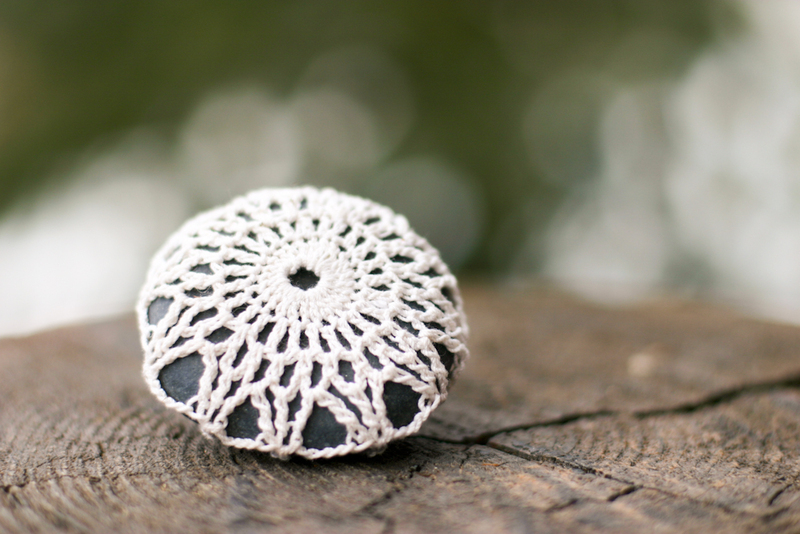 Well, I didn’t find any other tutorials for crochet covered stones online, other than this one by my talented blogger friend Molly, which is beautiful, but not really up my mom’s alley. Hmmm. I love the star pattern. And, it’s true, you start a crochet motif, and when your fabric just reaches the end of the rock, start decreasing the pattern and finish it off. If you make one or two of the purl bee little urchin pattern, how this works becomes a lot more clear. Now, heaven forbid, I leave it there. I can’t! After getting through the Northern Lights motif, I wanted to create my own motif to cover a stone. That way, I can provide a pattern/tutorial for you all to follow. This is my journey with most things these days. So I worked to figure out my own pattern (okay, two) and added a little twist. You’ll just have to come back to find out what it is I did! I’ll have step by step photos to make it as clear as I can. Thank you for a beautiful post and all the links. Your stones are lovely and inspiring! I love it! I also saw the tutorial on the Purl Bee, and had bookmarked it to try later on. Thanks for doing all the research! Maybe I will blaze forward & give it a go. I have always worried about finishing. Getting to the size of the rock seems clear enough, its the other side, especially ending. Thanks for the push. Wow! I went to Purl Bee through your link & read the pattern. I was so amazed, because what I’ve been worrying about is covering the whole back. Yay! & Thanks again. Wow is right – I cannot think of anything sweeter – best thing I’ve seen on line today! These are so beautiful. 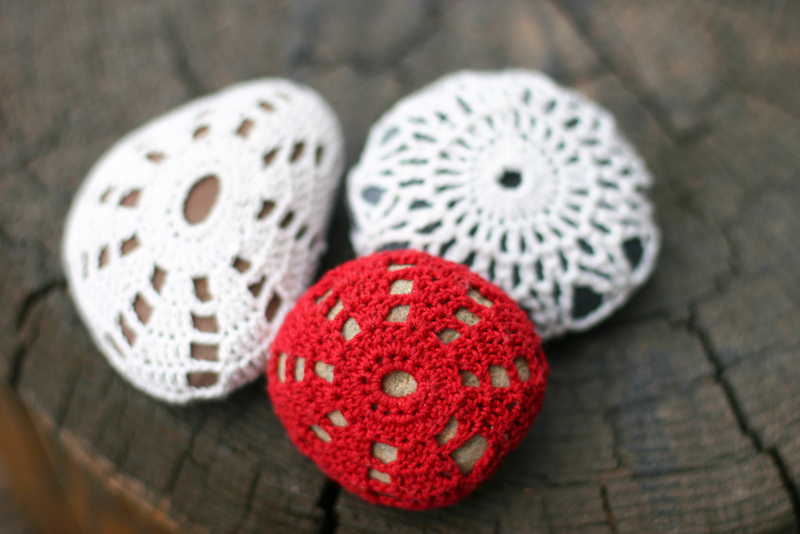 I have always loved painted rocks (albeit cheesy) but crocheted rocks!? you could start the whole pet rock trend over again!!! They are the wonderfully made, I really love how the red one pops. I tend to use ivory or white, and I was encouraged to use black, but I’m not there yet with using colours for my rocks! WIll get there soon enough. thanks for linking my rock! i went crazy a couple of years ago and covered every rock i could get my hands on. 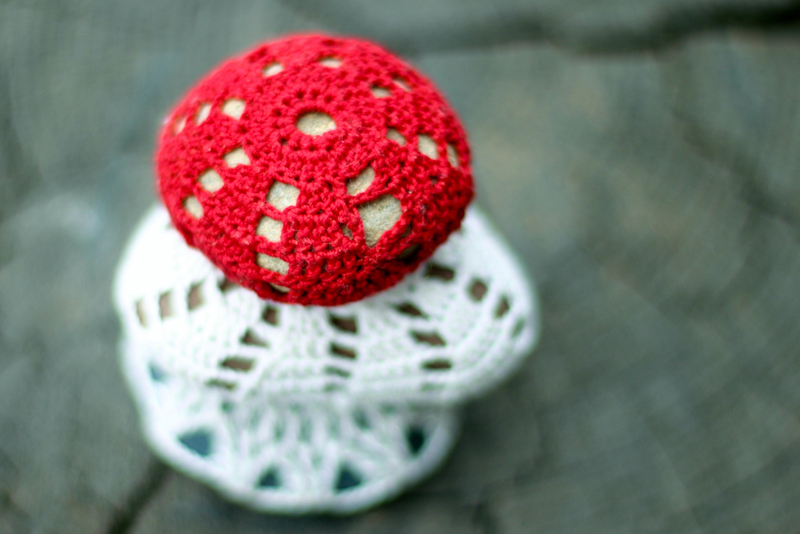 just last night, i noticed one of my little crochet covered rocks sitting on the table at my sister-in-law’s house. i’m guessing i made it for her about three years ago. so glad she still enjoys it! 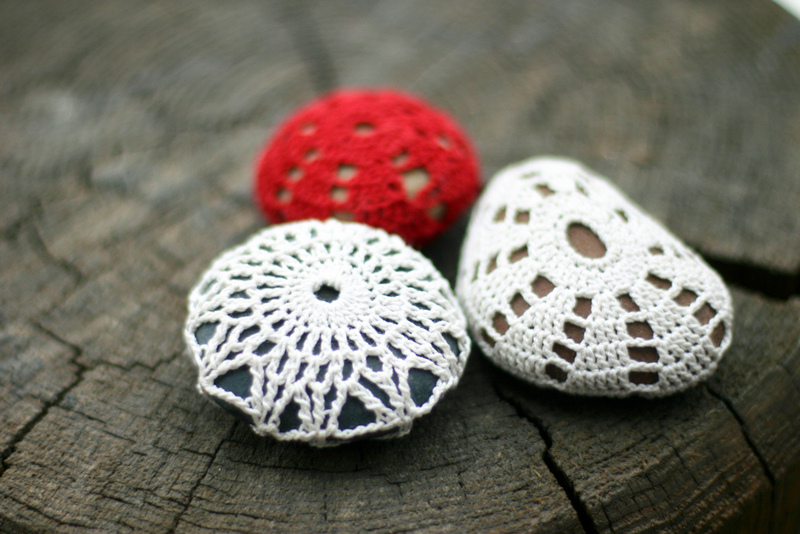 great tutorial and thanks for the links:) It has helped me a lot to crochet a few stones. I am so glad this has been helpful! 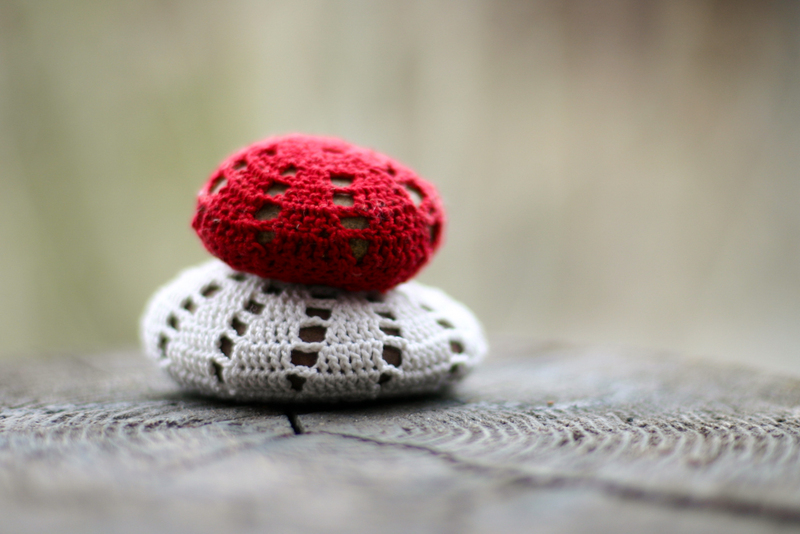 I love crocheting stones! Thank you. And, thanks so much for letting me know! hi i know this blog is old but you may want to remove the “missusd” links they flooded my computer wit a virus and are bad links. I’m so sorry about the Missus D links. I will remove that immediately! Terrible! Also I will fix the other links. Thanks so much for letting me know Erin, Did you find all the resources you needed. Since that post, I have posted two of my own crochet stone patterns and I have a video tutorial available as well. Thanks! I only found your eggs and pumpkin crocheted cover patterns. 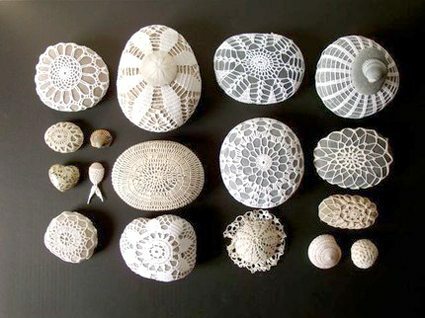 Can you tell me where to find your crochet stone patterns and the video? also the “northern lights” link goes to a site called ” allcrafts” with afghans, so that link does not work wither…thanks.